If you are ever stopped or spoken to by the police; if they pay a visit to your home, detain you on the street or interact with you in any way, it is YOUR RIGHT to video record them for your own protection. In fact, even if they do not speak to you and yet you see them in a public or private place, you have the RIGHT to capture their actions on camera. The police are fully aware that the public have the right to record them on duty. However this does not stop many of them from using threats, intimidation and even assault until innocent members of the public agree to shut off their cameras. What should you do if you wish to record the police but the officers concerned become hostile and threatening? 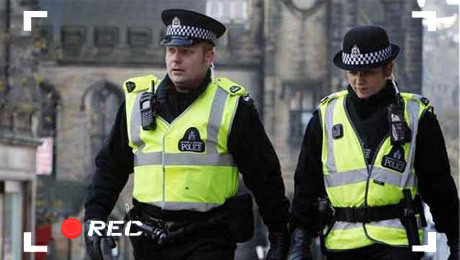 Understanding your rights, and communicating them is essential to ensure that the police do not unlawfully stop you from recording and that you can secure a permanent record of events should you later need it for a legal defence or to make an official complaint against the officers concerned. Below we have compiled a Q&A of the most frequently encountered issues when recording the police. We would recommend that you bookmark this page on so you have quick access to it on a mobile device, should you need to show it to any officer who is trying to prevent you from filming. DO I NEED A POLICE OFFICER’S PERMISSION TO RECORD OR PHOTOGRAPH THEM? No. In fact, you do not require ANY member of the public’s permission to record or film then in a public place. If this were the case, then Paparazzi would not even exist. There is no law that says you cannot record someone in a public place without their permission and you do not require any permit to do so. DO I NEED TO GIVE A POLICE OFFICER A REASON AS TO WHY I AM FILMING THEM? If a police officer approaches you and asks why you are filming, you are NOT obliged to answer them. You do not have to tell them who you are or what you are doing. If asked, you should only tell them that you have every right to record the police for your own personal records, and that if they obstruct you from doing so you will pursue a misconduct charge against them. CAN THE POLICE DEMAND TO SEE WHAT I HAVE PHOTOGRAPHED OR RECORDED AND IF SO, CAN THEY DELETE ANY OF THE INFORMATION? No they cannot. They would need a warrant under RIPA (Regulation of Investigatory Powers Act 2000) to access the contents of your device – and would have to arrest you to obtain one. If an officer asks to see what you have recorded or photographed, tell them that they have no authority to make you comply and if they wish to examine the device they should obtain the necessary warrant. Any officer attempting to delete recordings or photographs from a device is committing a criminal offence, as this constitutes the destruction of evidence. Remind the officer (or security guard) that such an action could result in serious charges being brought against them. WHAT DO I DO IF THE POLICE THREATEN TO TAKE MY CAMERA OR PUT THEIR HAND UP TO THE LENS? Tell them that if they continue to obstruct you, then you will make an official complaint of misconduct against them. Tell them that you will report them for harassment, intimidation and assault. Further your threats by insisting that any misconduct charges that may be dismissed by their superiors will be furthered in a civil court. Any police officer that manhandles you or your camera, uses threatening language or intimidation is acting unlawfully. If they force you to stop recording against your will, and you are not under arrest, then you should take a note of the officers collar number and name, contact the Professional Standards Department of the relevant police force and pursue a complaint against them. WHAT IF THE POLICE ARGUE THAT I AM INFRINGING THEIR RIGHTS BY RECORDING THEM? The British Police are public servants and should expect to be placed under more scrutiny than any passing member of the public. However police officers commonly make outlandish claims of breached rights when trying to convince a member of the public to stop filming them. Do the police object to the thousands of CCTV cameras that scrutinise us daily, without our permission or knowledge? Of course they do not. And yet there is no difference between you recording members of the public with a mobile phone and local authorities recording us all with CCTV. If you hear an officer complaining that “you are infringing their human rights”, “acting suspicious” or “harassing them”, do not allow it to intimidate you into switching off your camera. A police officer claiming he is being harassed whilst performing his duties is like a dustman complaining of a bad smell. Police officers often make unreasonable and unlawful demands of the public simply because they are used to people doing EXACTLY what they are told, regardless. Like most bullies, the police often back down when stood up to. THE POLICE TELL ME IF I DON’T STOP FILMING THEY CAN SEARCH AND ARREST ME UNDER THE ANTI-TERRORISM ACT, IS THS TRUE? Next to the Public Order Act, the Anti-Terrorism Act is the most abused piece of legislation when it comes to the police using threats of arrest to force people to comply with unlawful commands. Fortunately, Section 44 of the Terrorism Act – which allowed officers to stop and search without any reasonable suspicion – was repealed and no longer applies. The police now need very good reason to suspect that your actions are linked to terrorism before they can search you or arrest you. Your refusal to stop recording them when asked IS NOT a valid reason. Most importantly, your refusal to tell them what you are recording, or to refrain from filming cannot be used in itself as reason to search or arrest you, under the guise of “acting suspiciously.” However, this does not stop scores of bullying cops from unlawfully harassing members of the public until they surrender to the police officers will. If this should happen to you then you have strong cause to sue the police for unlawful detention or unlawful arrest. WHAT IF THEY THREATEN ME WITH OBSTRUCTION, INTIMIDATION OR HARASSMENT? As long as you are not obstructing an officer from performing his duties, blocking a public right of way, following people against their will or just generally causing a public nuisance, then the police have no grounds to move you on. A common tactic used by police is to claim that ‘members of the public’ have been complaining and feeling intimidated. If the police make such a claim you should ask them for the incident number that was logged when such members of the public called in. The police are required to give it to you when asked. If they do not, you can be certain that the police are lying. Make a note of their collar numbers and complain about them, or at the very least insist that you will make a complaint if they do not leave you alone. Remember, the general rule with the police is that they expect people to be ignorant of the law and to automatically do as they are told, regardless. IS THERE ANY OFFICIAL POLICY ON RECORDING THE POLICE I CAN SHOW TO THEM? I am writing to you in my capacity as Chair of the ACPO Communications Advisory Group which sits in the Presidential Business Area. • Once an image has been recorded, the police have no power to delete or confiscate it without a court order.